Fordham sophmore guard Joseph Chartouny. This was the game that the Rams needed and they responded Wednesday evening up at Rose Hill in the Bronx. 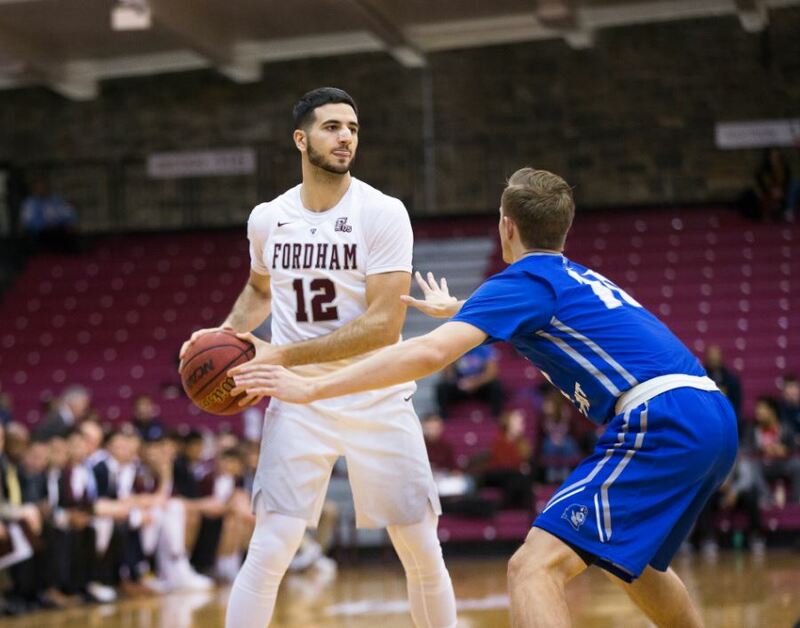 Fordham played well in a 83-60 win over Central Connecticut State. Central Connecticut State, losers of their last five games in the Northeast Conference, struggled. Fordham dropped their last six games and just finished a stretch of non-conference games before opening Atlantic 10 play next Thursday night at home. The contest was the kind of game effort that any coach will take prior to the opening of conference play. Players who have not had much playing time made an impression last night. 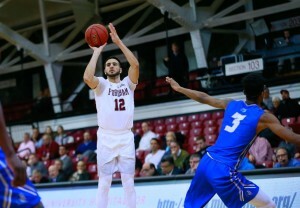 Chartouny shoots a jumper for two of his 14 points against Central Connecticut State. Photo by Robert Cole. Four of the regular starters scored in double figures. Antwoine Anderson scored 15 points, Christian Sengfelder and Joseph Chartouny added 14, Javontae Hawkins, who is averaging a team high 13.3 per game, finished with 16. That is needed production because the Rams during their skid were not converting many shots from the point, or on the run. So a struggling Blue Devils team may have been the remedy to get Fordham going. Central Connecticut though, gave Duquesne a game a week ago before losing that one 70-67. And when the Rams take the court again next week, they meet Duquesne in their first A-10 Conference game. Fordham as a team shot better than 56.6 percent. They also caused turnovers and that was another issue that needed attention during the losing streak. “Difference was we forced 24 turnovers,” said Neubauer. “That allowed us to get away from them.” It was also the first game the Rams scored more than 80 points since their 85-69 win over Lipscomb and that was their during fifth game of the season. And it was the play of newcomers who came off the bench and whose minutes on the court were a major boost for the team. With the Rams slowly getting back to health, Chartouny is banged up a bit, these are the role players that can have an impact when conference play begins. Neubauer saw his freshman forward, Sinan Saglam on the court. The 6-6 native from Istanbul, Turkey, played nine minutes, scored five points and passed the ball well to Chartouny. David Pekarek and Jesse Bunting who have had limited minutes also gave the regulars some time to regroup and get ready for conference play. However, when Fordham plays deeper into the conference schedule, these are the guys who will be called on. Neubauer was aware that giving them some playing time would have significant impact down the road. Fordham is now 6-7 after their first 13 games and the early tests are over. The Rams underclassmen have grown and are more conscious of their defense. Neubauer said he will give his team a few days off to enjoy the Christmas holiday and then it is back to work. Now the real season begins for these Rams. And if their growth is still a process they will quickly find out starting next week.